As I write these lines, the urban landscape of Berlin slowly gives way to a haze of green as the ICE train passes along a seemingly endless stream of fields, meadows, and forests on its way to Austria. It’s been a short homecoming for me this time. 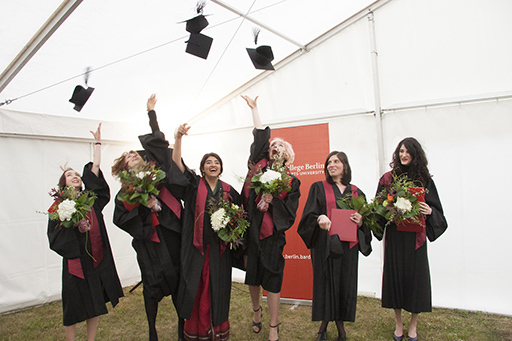 Returning from Paris, where I lived during my third year, I stayed only a few days to witness the graduation ceremony at Bard College Berlin. In a few hours there will be another homecoming for me, when I arrive in Innsbruck, where a part of my family now lives, and two weeks on there will be yet another one in Vienna, where another part of my family lives and where I grew up. Another two weeks and I will be back in Berlin again. My international peers, my teachers, and the staff at Bard College Berlin hail from some forty different corners of the world. School breaks give time to travel, to go home, or to explore the country and continent. If, as a student, you spend your third year abroad, you will see every other student generation for one year only. After four years we all say farewell, perhaps for good, even though many of us return to the place at some point, or stay in Berlin for a while. Hellos and farewells, departures and arrivals are really built into the very core of BCB life. And if you do something a lot, chances are you will get good at it. Farewells are no exception. 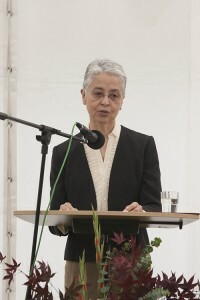 Perhaps the most beautiful demonstration was Paris Helene Furst’s student graduation speech. 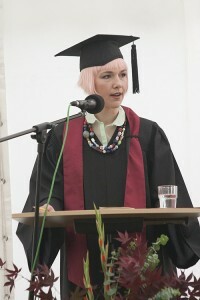 The intimacy of her speech extended to several aspects of this year’s graduation. Unlike the three previous years the event took place on campus this time, reviving an old tradition, with the gardens of our own cafeteria and a bright and spacious tent replacing the heavy oaken furniture of Rathaus Pankow or the vast main hall of the Ballhaus Pankow. Our cafeteria team treated us with excellent culinary pleasures, making hard work seem easy, and always with a smile. The choir ensemble accompanied the ceremony with a selection of finest music, from Brahms to the Beatles. Cheerfulness, gratitude, and the warmth of friendship marked the event. Adrian Piper’s graduation speech, too, felt more at home than it probably would have at any other college in the world. Uncompromising in form and content she chose to forego all conventions of the genre. Instead of palatable common places and feel-good imperatives, she proceeded, without much ado, to give a full-blown philosophy lecture, seamlessly picking up the argument where she left it in February, when she visited the college for a guest lecture. What is the value of one’s personal integrity, she asked, and how should it be measured against other values, like material or intellectual wealth, the opportunity to do good, community membership and status, livelihood, or even one’s life? Playing by the legitimating rules of a game of skill that genuinely expresses one’s core values, being a good sport in life, she had argued in her first lecture, increases in marginal utility every time it is consistently chosen over the cut-throat “rules” of the game of war, where sharks and sluggards compete no-holds-barred. Eventually, fidelity to one’s core values in thought, word, and deed will help these to align and to form a strong connection. It will shape one’s character, and produce the psychological and moral stability needed in times of adversity. This time she expanded her focus to the role of communities, which can support or undermine the values held and choices made by individuals, but which in turn also receive their values from their individual members. She asked the question of how we can know in particular cases whether an individual’s values depend entirely on others, or whether the individual grounds her values in her own reasoning, thus contributing to the community rather than merely drawing on it. She suggested that we can look at individuals who are displaced from their original communities to see if they change their beliefs and values, or at those whose values are in conflict with those of their community. Such conflicts can make it very difficult to hold on to one’s values and preserve one’s personal integrity. In some cases, such as threats to one’s life, it might seem as if holding on to one’s personal integrity is pointless. After all, what good are values, if the life that instantiates them is extinguished in defending them? Yet, Piper argued, the alternatives might not necessarily do much better. Caving in exposes one to the torments of a guilty conscience or the indignity of a life in denial, repression, even narcotization. Covert resistance – playing the game of war, but cheating on it, and thus secretly preserving one’s integrity wherever one can get away with it – similarly betrays confusion, self-deception, deliberate inconsistencies, and an avoidance of introspection, which undermine the option’s plausibility. Toughing it out and simply going ahead to follow one’s convictions publicly might be offering one’s head to the enemy on a plate. If you’re lucky, they will think you’re crazy. If not, you might lose your life. While these dilemmas cannot be resolved in the abstract, Piper concluded that insisting on one’s personal integrity, contrary to the opinion of John Rawls, is not a vacuous formal constraint, but can contribute to a substantive moral view. It calls for playing only the rule-governed games of skill that do not contradict one’s core values. It emphasizes the value of choice and the virtues of consistency, steadfastness, reliability, respect for principles, independence, personal achievement, and candor. It was a good message for those who leave us. It is certainly no less important a message for us who stay. The audience’s ability to deal with such a challenging graduation speech (again, in form and in content), the intimacy of the setting and speeches, and the heartfelt farewells go to show that the college does become a home to those who come to make it one. But a home of a peculiar kind. Susan Gillespie, Bard Vice President for Special Global Initiatives, emphasized it in her closing remarks, when she called it, quoting Board member Jens Reich, an “improbable place” that manages to “achieve intimacy in diversity”. Maybe some aspect of this combination can be grasped when we add another Kantian virtue to those that Adrian Piper listed for us: the virtue of hospitality. Some have argued that the concept of hospitality harbours a contradiction that renders it impossible: for there to be hospitality there needs to be a house with a sovereign master who welcomes the other and the foreign, but who, through that very act, loses the control and sovereignty that allowed him (primarily him) to host and invite in the first place. Hospitality needs sovereignty and undermines it: the conditions of its possibility turn out to be the conditions of its impossibility. But we could also look at it the other way around. What if everyone is host and guest at the same time? Saying farewell is built into the very core of the institution. Everyone leaves it at some point. And while we are here no one is sovereign enough to claim full and complete mastery over all its aspects, which the guests, the new strangers that arrive every year, could undermine. Because we all leave eventually and because none of us who are here have sovereign control of the place, we are all guests, to some extent. Nevertheless, in the absence of a single sovereign, we are also all called upon to live with hospitality and to extend our welcome to those who arrive here on many roads and walks of life. Because it is in living by and through the laws of hospitality–self-given, against all realities, possibilities, and plausibilities–that we might exert an autonomy as community, and perhaps that autonomy will someday also express a kind of sovereignty. It might be an utopic sovereignty “always to come”, every status quo a status quo vadis. Should that cause us any despair? Well, it is, of course, no smooth process. Not everyone is leaving happily, and not everyone is leaving voluntarily, either. Some stay longer and become more sovereign than others, are more host and less guest. And not everyone can come and stay: there’s doors and locks and entrance fees, and those who hold the keys. The idea of a sovereign qua hospitable community might sometimes be like a pious hope. But there is hope, and there is an irony in my third-year experience that gives me some: when I came to ECLA, as it was still called back then, I came to live a life of the mind, to immerse myself in great books (all 375, mind you!) and artworks in the almost monastic quiet and seclusion of our Pankow campus. When I went to Sciences Po for my third year I expected, and found, a place that thinks of itself– not entirely unreasonably–as the centre of the centre of world politics. It is a place where you can hear Kofi Annan, Ban Ki-Moon, and Al Gore come for guest lectures within three weeks’ time, and where everyone seems to have done at least two internships in an embassy or an international NGO before they even started their studies. But in many ways, it turned out quite the reverse. Though I learned a lot about politics in Paris, I was living a passive and contemplative life. Not a member of any community, thought was separated from action. But in Berlin it was and is the opposite: I think about many things that seem far away from the concerns of politics (from metaphysics to art history), but I do politics of some kind, and I am part of a community, and action remains inseparable from thought, sustaining it as it were, and engaging with it productively. Ruptures in community life reverberate through all layers of thought, action, speech, and self-perception, the alignment of which Adrian Piper pointed out is so crucial to any good life. But, having now experienced both, I take these challenges and the stimuli and growth they bring over the comfortable detachment of Paris life any day. Or workdays maybe, let’s say. Sometimes a semester off or two are a good thing, too. Quite conducive to mental health. But now I’m happy to be back in Berlin again soon, and I enter into my fourth year looking forward to many more hellos and farewells, to the shared stories that come with the former, and with the hope that the latter will be of a kind that always entails the promise and possibility of return (the last proof of hospitality). I look forward to going crazy over a senior project, to late-night discussions in dorm kitchens, to senate meetings (a little bit), and nights out in Berlin. It is summer now: breathe in, breathe out. If the coming year is anything like the last one, it will pass in the blink of an eye. Let’s make the most of it. Here’s to a good year 2015/16 together!